U.P Fly Fishing in "God's Country"
Rivers North is the original Fly Fishing Guide in the U.P. Rivers North Fly Fishing Guide Service of Marquette, MI offers secluded, guided fly fishing trips throughout Michigan's Upper Peninsula. Experience U.P. fly fishing with the only licensed and endorsed fishing guide service in Upper Michigan for Brook Trout, Brown Trout, Atlantic Salmon, Steelhead and Pacific Salmon! Join U.S. Coast Guard licensed and insured Captain Brad Petzke of Rivers North Guide Service for a remote specialized fly fishing outing on one of the many remote and scenic rivers/lakes of Michigan's U.P. Fly fishing in Michigan's U.P. has a strong heritage-with thousands of miles of Blue Ribbon Trout streams. The Upper Peninsula of Michigan is a fly fisherman's paradise! Rivers North Guide Service advocates catch/release because the future of our fishery here in the Upper Peninsula depends upon it. 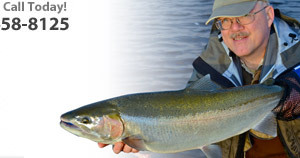 Rivers North has the most popular Upper Michigan Fishing Report online! Make sure to book-mark our report and check back frequently. If you want to know what we're catching, head over to our U.P. Fishing Report! You deserve a memorable Northern Michigan Fishing adventure. Upper Michigan - the U.P. Fly fishing in Michigan's Upper Peninsula has a long history-for centuries many have traveled to this remote area of the U.S. to fly fish for native Trout. The U.P. has hundreds of miles of spring fed streams that host strong populations of wild Trout that are eager to rise to a well presented fly. Riversnorth Guide Service of Marquette, Mi offers guided fly fishing outings here in Upper Michigan for Brook Trout, Brown Trout, Steelhead, Atlantic Salmon, and Pacific Salmon. Riversnorth is the authority of Michigan's U.P. when it comes to guided fly fishing-our experience insures our clients of a quality fly fishing adventure. From novices to advanced experts-the Upper Peninsula of Michigan has something to offer all anglers. 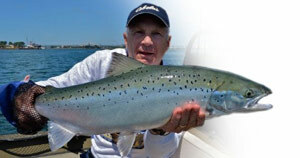 From dry fly fishing for trophy Brown Trout to swinging streamers on a spey rod for Steelhead-come to the U.P. and you will picture fly fishing in a whole different perspective!